↑ 7.0 7.1 7.2 7.3 บิชอป, คริส ยูเอช-60 แบล็คฮอว์คของซิคอร์สกี้ โอสเปรย์, พ.ศ. 2551, ไอเอสบีเอ็น 978-1-84176852-6. ↑ Leoni 2007, pp. 270-273. ↑ Arpia. SpanishDict.com. Retrieved on 30 September 2009. "Arpía [ar-pee’-ah] noun 1. (Poetic.) Harpy, a bird of prey represented by poets. (f)"
↑ 12.0 12.1 Leoni 2007, pp. 278-279. ↑ "Sikorsky UH-60 Black Hawk." Official Israeli Air Force website. Retrieved 30 September 2009. 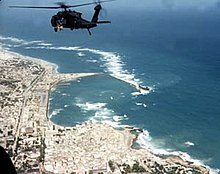 ↑ "United Arab Emirates - UH-60M BLACK HAWK Helicopters". US Defense Security Cooperation Agency, 9 September 2008. ↑ 23.00 23.01 23.02 23.03 23.04 23.05 23.06 23.07 23.08 23.09 23.10 23.11 23.12 DoD 4120-15L, Model Designation of Military Aerospace Vehicles, DoD, 2004. ↑ Leoni 2007, pp. 217-224. ↑ Leoni 2007, pp. 233-244. ↑ "Sikorsky Aircraft Fully Equips First U.S. Army Unit With UH-60M BLACK HAWK Helicopters". 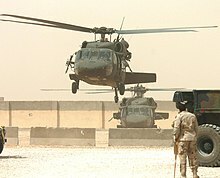 Sikorsky Aircraft, 10 June 2008. ↑ Colucci, Frank. "Modern Medevac Mobilized". Rotor $ Wing, 1 October 2004. ↑ 31.0 31.1 Leoni 2007, pp. 214-215. หน้านี้แก้ไขล่าสุดเมื่อวันที่ 18 กันยายน 2560 เวลา 15:06 น.